What began as a quest to construct a new facility for use by the baseball association at a local park became a multi-purpose community center of landmark design. 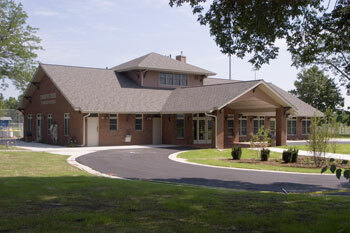 Designed as an architectural tribute to the community’s historic train depot which was razed to make room for construction of the new Village Hall, the center boasts a large banquet-hall style room, a complete catering kitchen which can be accessed from the banquet hall or through windows on the north side of the building for park concessions, large bathrooms and a covered outdoor terrace. The circle drive and portico-covered main entrance cast a regal shadow and are a point of pride for the community. The adjacent parking lot is large enough to accommodate the needs of gatherings of most any size. Kunkel Engineering Group is proud to have planned, designed and provided construction oversight for this project.